All documents used in this exhibition come from Alfred Szebel’s collection, a collector from Chicago who donated most of his valuable documents to the Pilsudski Institute Archives. 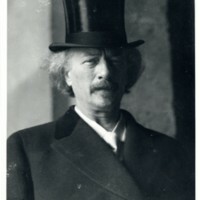 The Institute is extremely grateful for the amazing historical materials that Alfred Szebel has granted it with, as it can furthermore continue to fullfill its mission in educating people on Poland's history. This collection has been cataloged in the Institute’s archives as number 177. The first twenty volumes of this collection have been selected to show the history, activities and achievements of the Polish Legions and life of Józef Piłsudski. In the following exhibition, Polish Legion stamps, stationery, hand stamps, censor stamps and labels will be presented according to the category they fall in. The stamps change over the course of the war as some are printed to honor specific anniversaries. Beginning in January 1915, Polish Legions mail was managed by Austrian and Hungarian Field and Base Post Offices. During this period, Polish Legions seals were used in place of censor seals, which qualified them for free postage. Nevertheless a considerable amount of correspondence still carried Polish, Austrian, or German censor seals and inscriptions, as well as those of the Legion formations. The postcards, letter cards and envelopes of the Field Post bore the Fusiliers eagle. Although postcards showing Polish eagles of varying design were mostly destroyed during World War II, this collection contains a select few. Soldiers of the Polish Legions had wide access to Austrian and Hungarian field postcards, various picture cards and many kinds of postal stationery materials. Seals and hand stamps of the Polish Legions gave the letters a military character, exempting them from postal charges. Hand stamps are the most common type of marking to be found on Legion mail. There are many different types and are best classified by date of issue or official characteristics. From time to time censor stamps were impressed on cards and letters by an officer in the Offices of the Unit Command, or by a non-commissioned officer appointed to the role of Postal Censor. Before the outbreak of World War I, labels connected with army action had already been in use for several years. 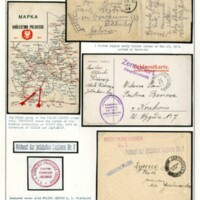 Labels issued by the Supreme National Committee in the years of 1914-1915, served the same purpose and were often stuck to Field Postcards stamped with the date stamp of the Austrian Field and Base Post Offices.